London is experiencing a surge in the number of tall buildings reaching the construction stage with 70 towers under construction in 2015 – a rise of 56% compared with 2014 according the Architects Journal. 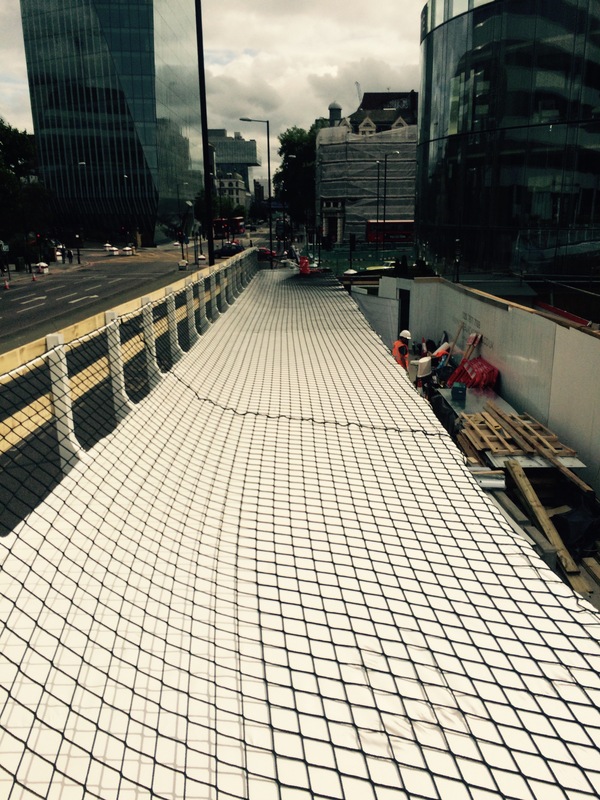 Rhino Shrink Wrap are involved in a number of projects to provide temporary weather protection to construction sites in London. 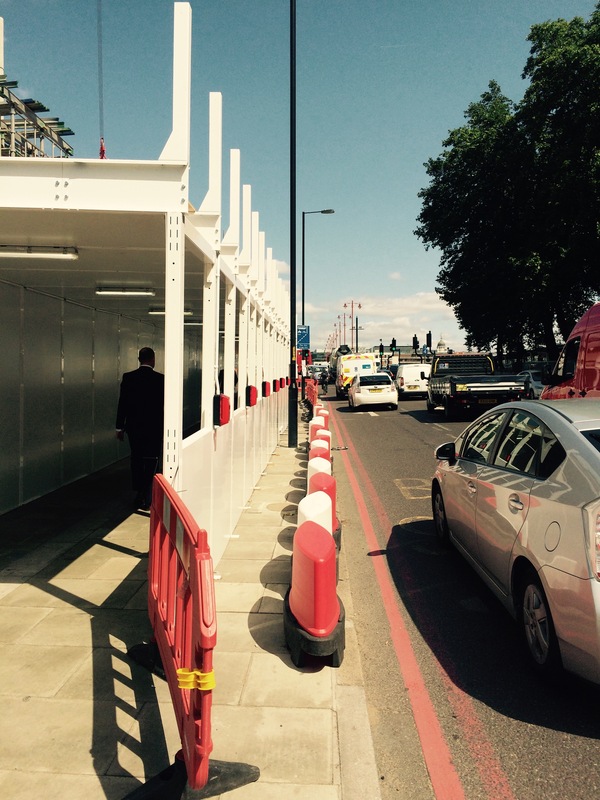 In July we were contracted by SafeRoute FM Ltd to provide temporary weather protection to a pedestrian tunnel at ‘One Blackfriars’ in London. One Blackfriars is a 50 storey tower under construction at the junction of Blackfriars Street and Stamford Street in Central London. To protect the 4000 or so pedestrians that are expected to walk past the site each day during the construction process, a 3m wide by 40m long SafeRoute ‘System T’ tunnel was erected over the pavement around the construction site. In this first phase, the tunnel was constructed only along Blackfriars Street, it is planned that another tunnel will be erected along Stamford Street in phase 2. To begin, concrete blocks were craned into place which allowed the tunnel frame system to be securely bolted and fixed into position. Once the tunnel frame was fixed, 3mm aluminium composite boards were installed on the tunnel sides with 10mm roof boards being installed in the tunnel roof. To provide an additional level of protection against falling objects or debris, an extra protective layer of 10mm roof boards were installed on the roof of the tunnel. 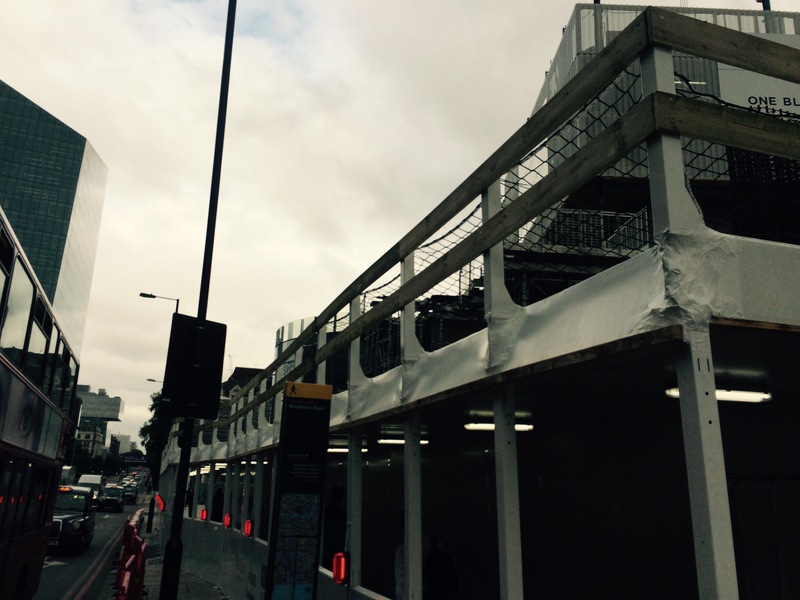 In the final stage of the process, Rhino Shrink Wrap were asked to provide temporary weather protection to the roof of the pedestrian tunnel using our ‘signature’ 300 micron thick, industrial grade, shrink wrap plastic film. Working over the weekend, a team of just two Rhino Shrink Wrap installers fitted approximately 120 square metres of industrial grade shrink wrap film to a roof area 3.2m wide x 40m long. The challenge with the shrink wrap encapsulation of any temporary roof is making sure that the joints between the weather protection sheeting will not leak. Shrink wrap sheeting is beneficial in this regard for two reasons. Firstly, the sheeting is generally supplied as a 7m wide x 15m long roll. This means that it is possible to cover up to 100 square metres without requiring any joins whatsoever. In addition, where a joint is required between two pieces of shrink wrap sheeting to join sheeting this is carried out by overlapping the two sheets by 30-40cm and using a hot air gun to heat the film close to it’s melt point. At this stage the sheets are pressed together to create a completely sealed joint which is stronger than the original material. In order for the shrink wrap sheeting to provide temporary weather proofing until well into 2016 the sheeting contains Ultra Violet Inhibitor to prevent degradation (in addition to being flame retardant to EN13501). Once the roof had been fitted and heat shrunk ‘drum tight’, the Rhino installation team fitted a suspended safety net above the roof to provide additional protection to pedestrians in the event of an objects falling from the tower during the construction process. The key challenge on this project was that because the pavement required closing to pedestrians during the erection and shrink wrapping of the tunnel, this necessitated weekend working. In this residential area we had to respect the restricted weekend working hours which limited our teams to just 6 hours per day. Nevertheless the work was successfully completed in just one weekend. Heat sealed joints between sheets created a completely weather tight, full encapsulation of each module. Smart & professional appearance for a high profile project. Easy to remove in sections at the construction site & 100% recyclable. 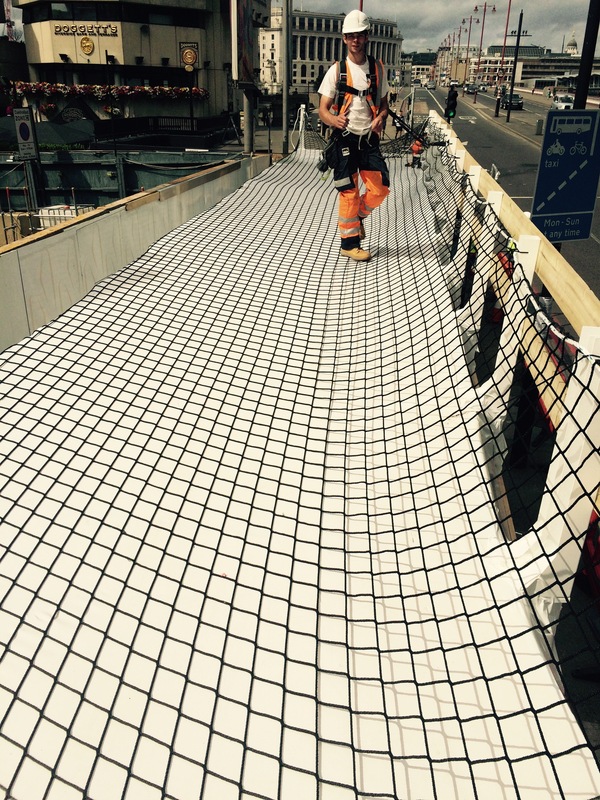 SafeRoute FM Ltd. specialise in the design, fabrication and installation of modular pedestrian protection systems which provide a protected passage through construction areas. Since 2007 they have installed temporary protective tunnels, hoardings and rooms in the rail, retail, education, health, aviation, utilities and civil engineering sectors. One Blackfriars is a 50 storey tower with two smaller 4 and 6 storey buildings, under construction at the junction of Blackfriars Road and Stamford Street, Bankside, London by the Berkely Group. Upon completion the mixed use development will consist of a hotel, retail outlets and residential apartments ranging from £1.5M to £23M. Rhino Shrink Wrap specialise in providing temporary weather protection and containment to construction and industrial projects using our ‘signature’ industrial grade shrink wrap sheeting. Rhino have 3 full time teams of installers and we also supply shrink wrap materials and equipment plus training to scaffolders and contractors who wish to carry out the service ‘in-house’.